An insurance deductible is the amount of money you would pay in the event of an accident (assuming liability). For example, a standard insurance policy may be $100 a month with a $1000 deductible. Meaning in the event of an accident, you would be responsible for $1000 and the rest is covered by your insurance policy. This is to promote safe driving habits and spread the full cost of an accident across several parties (insurance company and insured motorist). 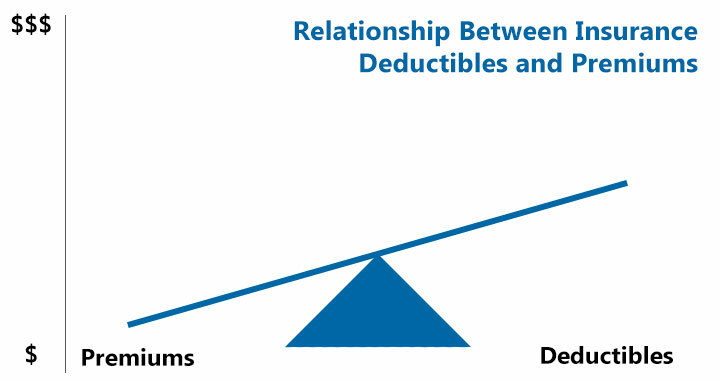 These two figures (the monthly premium and the deductible) often move in opposite directions. 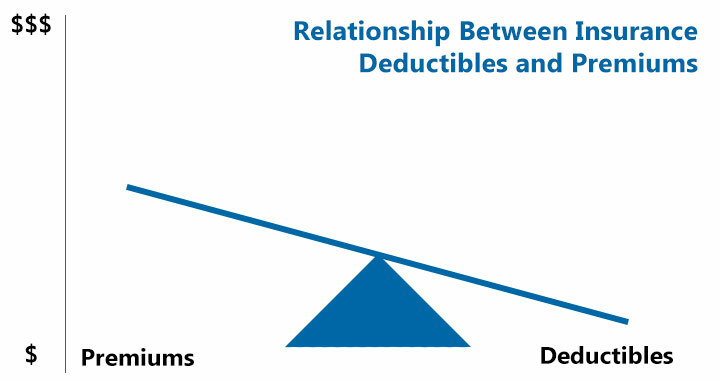 The figure above demonstrates that if you choose a lower monthly payment (premium) your deductible goes up. The opposite would be a higher monthly premium, which would result in a lower deductible. There’s many variables to consider when deciding between a high or low deductible. It’s a logical, financial and personal decision that determines what fits your needs best. Insurance policies are based on risk with each party in the agreement assuming some kind of risk. Insurance companies offer several policies to fit peoples needs with some policies requiring higher monthly dues and others higher payments in the event an insurance claim is submitted. The policy that best fits your needs will depend on several factors including current financial obligations and even future cash flows. When one enters into an insurance contract, it is important to determine whether you will have sufficient funds to cover the event of an accident (medical bills, medical co-payments, deductibles, rental car fees, etc). Let’s break down the two most popular types of motor vehicle insurance. High and Low Deductible Insurance. In 2012 there were 5,419,000 police-reported motor vehicle traffic crashes. Most of which occurred in large urban areas and metropolitan areas. This increases the likelihood of being in a car accident. That is why rural insurance policies are significantly less than urban insurance policies. Per the Association for Safe International Road Travel, Road Crashes in America cost $230.6 Billion per year. This a great policy for those who wish to be rewarded for safe driving habits and are willing to risk higher out of pocket expenses in the event of an accident. Example policy is $100 monthly premium and a $2500 insurance deductible. Many people choose to increase their risk and opt for a higher monthly insurance payment but a lower deductible. This ultimately reduces your out of pocket expenses in the event of an accident. This is great for younger drivers on the road who could be more reckless in their newly developed driving habits or for repeat road offenders. Aggressive drivers should opt for a lower deductible since the odds of them being in a collision is greater than those who drive conservatively. Example policy is $200 monthly premiums and a $1500 deductible. Factors that should be taken in consideration at the end of the day should be plain and simple, and that’s your driving record and your current finances. If you have a great driving record and you have more than 10 years, you can probably lower your collision deductible without much difference in your monthly rate.The typical car insurance deductible increment choices are as follows: $250, $500, $1,000, and $1,500. If you’ve never been in an accident or even received a parking ticket, it’s within reason to deviate towards the higher deductible. If you have a reckless driving accident history then you obviously need to take the smarter route and get the lower deductible route. Again, adjusting your finances on a ‘maybe’ situation can be the major deciding aspect. An additional food for thought factor in your car insurance rates is the coverage you choose to carry on your policy. You will pay more for higher coverage limits and for carrying optional coverage’s; however, these optional coverage may offer much-needed protection in case of an accident or other vehicle-related incident. Liability insurance is typically a legal requirement; however, other coverage’s such as collision and comprehensive are generally optional. Contact our Miami Auto Insurance Specialist today or visit the Insurance Industry Blog for more information.